Ashley Weaver, PhD, performs image analysis and computational modeling focused on injury biomechanics and medical device applications. She collaborates with industry partners to develop anatomical models for device design and injury risk prediction in space flight, automotive, military and sports injury scenarios, with a specialized interest in bone quality and health. 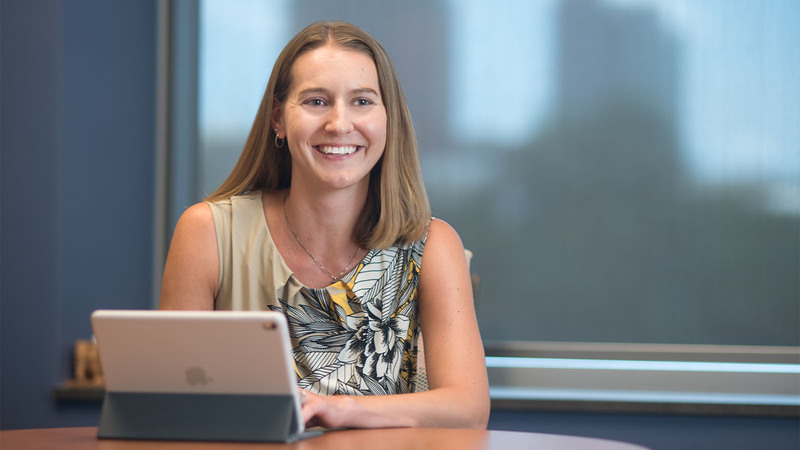 Ashley Weaver, PhD, earned her doctorate in biomedical engineering at the Virginia Tech-Wake Forest School of Biomedical Engineering and Sciences, where she also completed her postdoctoral work. She focused on thoracic skeletal biomechanics, using image analysis and finite element modeling to explore anthropometry changes and injury risk. She also examined material property changes in bone density and cortical thickness mapping. In 2014, Weaver joined the department of biomedical engineering at Wake Forest Baptist Medical Center to research injury biomechanics. Weaver’s primary area of expertise is the intersection of medical imaging and computational modeling. Using computerized tomography, magnetic resonance imaging, and finite element modeling, she develops anatomical models that can be used to predict injury and evaluate and develop medical devices. She is particularly interested in bone quality and fracture prediction, analyzing and mapping bone mineral density and cortical thickness changes relative to weight loss and exercise interventions, age and disease for various populations. Through a study with the National Aeronautics and Space Administration (NASA), she is using computerized tomography and magnetic resonance imaging-based modeling to measure vertebral and spinal musculature degradation and dynamic vertebral strength changes in astronauts pre- and post-flight, predicting strength and injury risk based on individual anatomy and spinal health. She is also actively involved in research studies that investigate simulated reconstruction of real-world motor vehicle crashes and postural changes to predict injury risk and improve safety. Developing solutions that account for biological variability in order to help mitigate or prevent injury is central to Weaver’s motivation. Working with industry, she has developed anatomical models for medical device design and evaluation, including a thoracic and soft tissue model examining respiration in different postures to characterize the heart and lung location relative to the rib cage. Weaver is particularly interested in partnerships with industry that integrate anatomical and finite element modeling to measure bone health and fracture prediction, with widespread application to motor vehicle crashes, trauma, military and sporting scenarios, space flight and disease.